The highly decorated interior of Holy Trinity, Hethe. This Sunday, 12th November and Remembrance Sunday, will see Fr Anthony Talbot's last Mass in the Chapel of St John the Baptist, Spetchley Park. After a short break, however, he will celebrate his first Sunday Mass in Holy Trinity, Hethe, near Bicester, on Sunday 7th January (updated). Fr Talbot will be missed in Spetchley, but welcomed in Hethe! 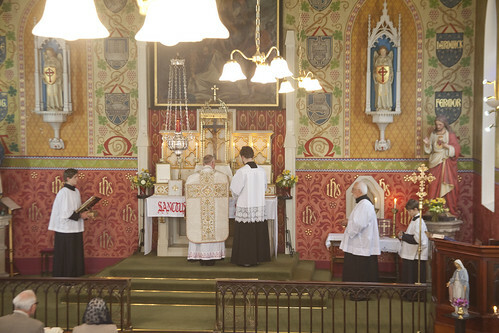 This will bring to an end the current situation of a rota of priests serving this Sunday Mass, at 12 noon, which was established three years ago by the Parish Priest Fr Paul Lester. These Masses are sung on the 2nd and 4th Sundays of the month.